An old boiler at the back of the courtyard at The Old Laundry is a reminder of the commercial laundries that operated through Perth in the early 20th Century. 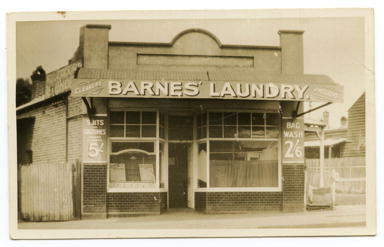 While the boiler is located at this premises (once a dry cleaners), Barnes Laundry operated opposite this site at 21 Angove Street in the 1930s, in the present day location of Chilli Orange. Formerly named the Rosemount Laundry, the rate books show that Charles Barnes was the resident shopkeeper from 1933 until 1945. He may have closed the laundry around 1942 to 1943, as classified advertising of the time shows a range of second hand laundry equipment including a rotary washer and ironing machine being offered for sale. Many laundries from 1900 were run by Chinese immigrants, who had arrived in Western Australia during the gold boom to provide labour, but were restricted from holding mining rights. In 1905, there were 31 Chinese Laundries in Perth CBD with a concentration on William and Hay Streets, and 10 in Fremantle, with a number scattered through the suburbs. A report in The West Australian in March 1914 stated that one European and one Chinese-run laundry were operating in North Perth at that time. The total count of laundries in the Perth metropolitan area included 82 Chinese-run, 12 European-run and 1 Japanese operated businesses. “the application was not for a licence but for the renewal of one, and that the council should have refused the request in the first place, for he objected to Asiatics, but he did not think it would be fair to make a refusal now”. When the renewal motion was carried, Cr Gartrell exclaimed “They’ll be civil servants next!”. A letter from a laundress quoted in The Sunday Times in 1917 mentioned that her class of business was ‘monopolised by the Chinese’ and lamented that more women were not willing to do the hard work of running a laundry. She stated that she had been supporting herself and her husband, who was permanently disabled, for five years and that takings from the business earned a ‘good living’ of over 5 pounds per week.